An Airbus A320-232, N655AW, was substantially damaged when the engine cowling separated and struck the horizontal stabilizer during takeoff at Las Vegas-McCarran International Airport, Nevada. There were no injuries. The aircraft was operated by America West Airlines as flight 2747, a regularly scheduled domestic passenger flight, destined for Columbus, Ohio. 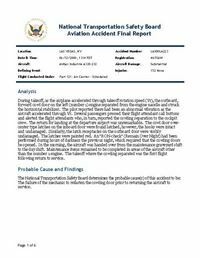 According to the operator, the pilot reported there had been an abnormal vibration as the aircraft accelerated through takeoff rotation speed (Vr). Several passengers pressed their flight attendant call buttons and alerted the flight attendants who, in turn, reported the cowling separation to the cockpit crew. The return for landing at the departure airport at 13:31 was unremarkable. The aircraft was taxied to the terminal gate and the passengers deplaned normally. Postflight inspection revealed that the outboard, forward cowl door on the left (number 1) engine had separated from the engine nacelle. There was a 10-inch cut through the landing gear (strut) door and there were 3 holes in the lower surface of the left horizontal stabilizer, each approximately 2 inches wide and 8 inches long. The cowling door hold-open rod penetrated the lower skin and aft spar web of the horizontal stabilizer. No damage was observed on the wing or wing flap. The opposite (inboard) cowl door and the "bull nose," where the two doors hinge at the 12 o'clock position, were damaged but remained attached to the nacelle. The cowl door over-center type latches on the inboard door were found latched, however, the hooks were intact and undamaged. Similarly, the latch receptacles on the outboard door were visibly undamaged. The latches were painted red. The operator reported that the aircraft remained overnight in Las Vegas and an "RON-check" (Remain Over Night) had been performed during hours of darkness. The RON-check required that the cowling doors be opened; however, the mechanic performing the work reported that the cowl doors were closed and re-latched about 05:30 - 06:00 during hours of daylight. In the morning, the aircraft was handed over from the maintenance graveyard shift to the day shift. Maintenance items remained to be completed in areas of the aircraft other than the number 1 engine. The takeoff where the cowling separated was the first flight following return to service. The failure of the mechanic to refasten the cowling door prior to returning the aircraft to service. Distance from Las Vegas-McCarran International Airport, NV to Columbus-Port Columbus International Airport, OH as the crow flies is 2824 km (1765 miles).